Search Engine Optimization (SEO) is a range of activities to improve your visibility in the search engine rankings/listings. Historically you would create a site and wait for visitors. This is no longer enough. Would you leave your brochures in the cupboard? There are millions of websites. You need to be visible. GET SEEN – Search engines are the primary method of finding & researching information. 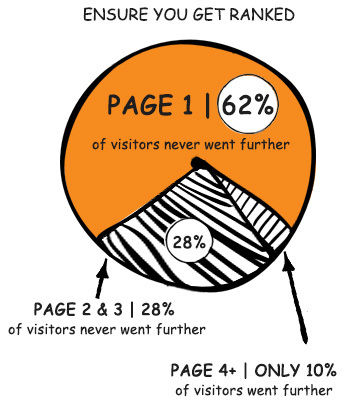 GET SEEN FIRST – Nearly 90% of search engine users abandon their query within the first 3 pages. GET SEEN RIGHT – 36% of search engine users believe top ranked companies are category leaders. There is little point in creating a website that visitors cannot find. The website has become one of the most important marketing channels. If your competitors are found before you, then you LOSE! Natural (Organic) Search Rankings are very effective at driving traffic and generating quality leads.